“9DWOTM” discards the conceptual approach Vision Divine had adopted for the previous 3 albums. And it’s another album, another line-up – as fans of the band must have got used to by now. Possibly the most notable ‘new’ recruit for “9 Degrees…” is Rhapsody’s vocalist Fabio Lione, who of course had already sung in Vision Divine’s first 2 albums. 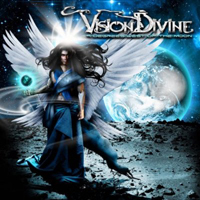 The new album from Vision Divine is progressive, melodic and heavy…..quite heavy in fact. It also covers quite a lot of musical ground while retaining a holistic feel by keeping itself rooted in Melodic Power Metal. The sound that emerges from all this is quite good really. Comparisons should be used sparingly, as today Vision Divine enjoy their own distinct reputation – despite this I also couldn’t fail to notice techniques used by Kamelot such the way the keyboards and drums interact. This isn’t mean to be a form of negative criticism – quite the opposite in fact. The only moments I wasn’t entirely convinced by the album were in the more Progressive-sounding songs. The band sound better when focusing on melody and power. Some truly excellent songs grace this album. For example the 8-minute + ‘Letter To My Child Never Born’ has all you’d ever want from a Metal song: melody, feel, heaviness, great musicianship…..in fact this must be one of the best songs ever written by guitarist Olaf Thorsen, the band’s driving force. With lyrics bent on nostalgia ‘The Streets Of Laudomia’ is another song boasting great hooks and that would certainly fit well in a live setting. The song This time around Vision Divine cover ‘A Touch Of Evil’ of Judas Priest. In this song as well as in ‘The Killing Speed Of Time’ Fabio Lione impresses when he tries out different ways of singing. “9 Degrees…” was produced by Timo Tolkki (Revolution Renaissance, ex-Stratovarius) which is in a way surprising as the album’s sound is more versatile and abrasive than that Timo had crafted in the more recent Stratovarius releases. Having said that, he must have been working on familiar material when engineering songs such as ‘The Streets Of Laudomia’. “9 Degrees West Of The Moon” is Vision Divine’s most mature album to date and is one I heartily recommended.